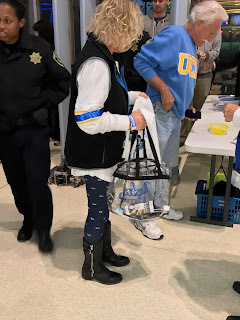 Last night, I went to a basketball game at UCLA. Women were prevented from entering the arena with any opaque bag larger than a clutch. Women who showed up at security with a purse were sent outside the arena to leave their purse at check-in. Ladies had the option of transferring the contents of their bags into a clear plastic bag if they wanted to. It turns out this policy mimics the NFL's; the NFL says it has "unanimously" implemented the same poor security practices at their stadiums. Here's the problem... the security metal detectors can't detect leather. The clear plastic bag policy is trying to mimic TSA security policies in form over substance. Why can't a woman bring an opaque bag into an arena? I don't know. What the NFL is accomplishing with this policy is known as security theater. Most people recognize that security is usually a trade off with convenience (although it doesn't necessarily have to be) so, if a policy is implemented at an institutional level that is highly inconvenient then it must be safer, goes the thinking. In other words, it's inconvenient security theater without making the venue safer – if anything, it puts added risk on their fans due to the hassle of standing in line in the rain (which is what happened last night) plus transferring stuff between bags, in the dark, while having a college kid watch your bag, etc. Let's keep America scared. I think you see my point.